The time is dusk, just moments after the sun has sunk below the rolling hills and the last golden rays have become but a faded memory. Night is swiftly approaching and all around the colors slowly begin to fade like an enclosed, dying flame. In the far off distance, the trees surrounding the long grassy field where you've just exited your car are obscured by deepening shadow. You turn back, pausing so your girlfriend can catch up. You can see the fear in her eyes. You grab her hand in an attempt to reassure her, but the gesture is as much for you as it is for her. You turn away before she can read your face. Up ahead you see the familiar angles of a man-made structure cutting across the blue-black sky. You approach the barn with growing unease, your mounting trepidation evidenced by the beads of sweat pooling on the nape of your neck. There's a small tent in front of you where you pause, smiling at the two women sitting behind the faded, wooden picnic table. They smile at you fondly, but you cannot feel the warmth. Thoughts of your impending doom cloud your mind. "Two, please," is all you can manage to utter as your vocal cords begin to tighten. They hand you two tickets and you proceed towards the barn. Haunted Overload is a haunted attraction currently located at 118 North River Road in Lee, New Hampshire. This is the address of the Coppal House Farm, which for the last few years has served as the host for Eric Lowther's diabolical brainchild. The haunt began its life in the front yard of Lowther's home, but over the course of a couple of years it grew much too large to be contained therein. Many of the props and costumes on display are one of a kind items that were hand crafted by Lowther, a former student at the Joe Kubert School of Cartoon and Graphic Art. It is these skills that have made Haunted Overload one of the most elaborate and creative haunted attractions in America. These achievements have not gone unnoticed and in 2008 Haunted Overload earned the privilege of being named the number four haunt in the nation by Haunt World Magazine. To step back for a moment, I realize there may be some of you whom have never heard of the concept of a haunted attraction. Briefly, it is a form of entertainment where patrons walk through some sort of venue, be it a house or a walking trail, with the intent purpose of being scared. The haunted venue is typically populated with actors portraying a variety of ghosts, demons, maniacs and other assorted horror-genre staples. As you walk through the attraction, the costumed fiends do their best to unnerve and frighten you. 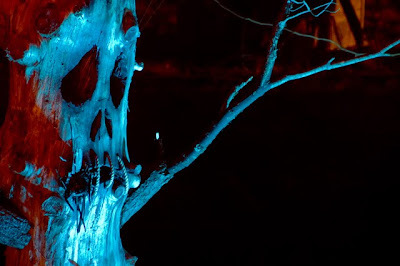 Typically the actors are assisted in this venture by the general ambiance of the haunt, whose lighting, sounds, props and various set pieces are all designed to further immerse you in the experience. Many people I know think it is strange that I would ever go to these types of attractions, not understanding the allure of paying strangers to scare the hell out of you. In reality, it's no different than buying a ticket to go see the latest thriller at the local movie theater. You might be terrified and literally jump in the moment of the scare, but you quickly realize what great fun it can be and the screams melt into laughter. This type of fun is best experienced in numbers so, if possible, be sure to bring a large group of friends along for the ride. It's typically a night that you will talk about for weeks to come. The 2008 edition of Haunted Overload begins with a short line leading up to the edge of a corn field. Passing through a small hut, you enter into the corn. Immediately various actors, hidden by the gloom and the texture of the corn, begin to pop out from their cleverly hidden monster closets. As you make your way further into the corn, you begin to hear the constant, repeating thuds of a heavy chain being violently slammed against some nondescript, hard surface. You emerge from the corn into a clearing, a small shack directly in front of you. The noise of the chain is deafening as you turn the corner, suddenly face-to-face with the towering monstrosity creating the clamor. The monster is like nothing you've ever seen before; a melted face almost lacking in features, its hooded, beady eyes staring into you. He slams the chain again and you involuntarily jump back. You're afraid but somewhere in your mind remember this is only a haunt. You rationalize that the actor has done his bit and is now done with you; you are now free to pass. Your courage swells and you take a hesitant step forward. The timing now is both critical and perfect; no sooner do you begin that forward motion than the monstrosity lunges for you! You dart past him, screaming and flailing wildly as you make your escape. It is at this moment, if you can think at all through the sheer terror, that you realize that the folks at Haunted Overload are professionals. This is going to be a long walk through the woods. The corn stalks are only the beginning of your 45-minute descent into hell. Although the haunt is constantly being added to and expanded, I don't want to go into any further detail about the layout of the attraction for fear of spoiling it for the uninitiated. I do want to mention that the quality of the various set pieces are way above the standard fare. Dotting the landscape are giant, menacing Jack-O-Lanterns and ghostly trees with faces twisted in abject horror. Cleverly and creepily lit thirty-foot-tall witches tower over the graveyard. And just past the corn maze, in what might be my favorite part of the haunt, the trail opens up onto a wide dirt path lined by hundreds of expertly carved Jack-O-Lanterns. The eerie, flickering lighting dancing against the blue-black sky is beautiful in a strangely demented sort of way. Of all the haunted attractions I have patronized, and I've both been to and worked at my fair share, Haunted Overload is my current favorite to beat. My first visit was in 2008 and you can be certain that I will be making the trek again in 2009 and onwards. It's a long drive, but in the end it's worth it. Interestingly, Haunted Overload is only open for 6 nights out of the month of October. I can only assume this is due to the sheer amount of hard work that goes into preparing the attraction for the public. Another positive side effect of this schedule is that it ensures that the staff and actors are enthusiastic and not worn out from a whole month's worth of performances. For most nights the haunt is open, there are two different start times at which they begin to let small groups of people into the haunt. This scheduled start-time ensures that the wait is much shorter than at many other haunts I've attended. Costumed actors also come out to keep the line entertained, so be sure to keep an eye out for creeping clowns and other stealthy, scary spirits. 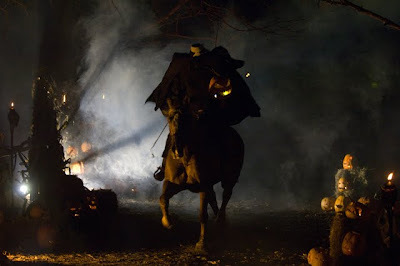 My favorite of these was either the Headless Horseman, an impressive figure mounted on a real-life horse, or Jack-O, the towering, long-fingered phantasm with a pumpkin for a head (complete with moving jaw and diabolical laughter!). For those of you with younger children, Haunted Overload does offer a special showing lighter on the scares. During the daytime you can also purchase a $3 ticket at the farmstand and walk through the haunt sans actors. I'm hoping to do so this year so that I can fully appreciate all the detail in their intricate sets and props (and maybe pop a few pictures if allowed!). On their website you can check the full schedule of showtimes as well as pre-order tickets. Tickets must be purchased ahead of time, so if you're not from the area you must secure tickets online first! Also located at Coppal House Farm is a 6.5 acre corn maze that is open during the day and closes around sundown. This means that a trip to Haunted Overload could be made into a full-day outing. If you're anywhere near New England, I highly encourage you to check out Haunted Overload. Eric Lowther and the rest of the staff and crew should be extremely proud of their craftsmanship and the quality of the production they put on display. Much to my girlfriend's chagrin, I am adding this one to my list of annual destinations. Haunted Overload is simply one of the definitive haunted attractions that you must experience. As always, comments are welcome below. If you enjoyed this review, may I suggest checking out my review of the Trail of Terror - 2009, a haunted attraction located in Wallingford, CT. Please click on an ad and join my Facebook fanpage to show your support for the Geek! I'm one of the Haunted Overload denizens, and I just wanted to thank you for the fantastic review. Your description of the work that goes into the haunt is absolutely accurate, and I assure you we've been working just as hard to make things bigger, better and scarier for this year. 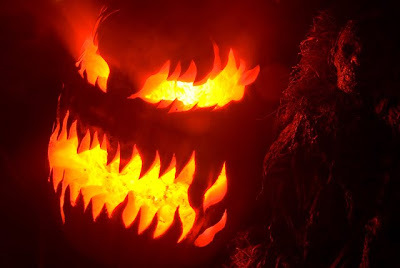 Looking forward to seeing you--please say hello to my alter ego--look for a tall female character right before the point-of-no-return entrance after the pumpkin walk. I'll be sure to give you a warm welcome. Thank you for the comment, Rae. I cannot wait to see what the Haunted Overload crew have in store for all of us this year! I haven't decided what night I'm going to make the drive just yet, but hopefully I'll catch a ghastly glimpse of you there! Sorry for the deleted post I just tried to fix a typo after the fact. Man what an awesome review! It was a great surprise to read. I'm glad you liked our attraction. I wish I could write like that LOL! You will love what we have in store for you this year. The new Soul Taker's Burial Ground is looking insane! We also have added some top notch new actors to our ever growing team. There are 5 new videos up on the site. This one is one of my favorites because it's short and non stop screams, shot in night vision. I love near the end when the girl yells Jesus , Mary and Joseph! LOL! Enjoy and I hope to see you there. I'll be running by with a chainsaw as usual! Great review and very accurate too. This is my 5th year working as the Haunted Overload videographer. I have witnessed this haunt grow from a local neighborhood attraction to a national haunted attraction phenomenon. Eric is blessed to have an army of volunteers who share the same passion for Halloween as he does. They are all talented and outstanding individuals. Creating the haunt is an extraordinary team effort. This review captures the essence of this place. Nicely done. This review was fantastic and sooooo accurate. We have a photo of Eric was he was 2 years old, holding a pumpkin while standing in his Dad's work boots. It all started then! His passion has grown and now he's known nation-wide. We are proud of you Eric! Well, it has all been arranged. My friends and I have pre-ordered our tickets for the 7PM start time on October 31st. I look forward to seeing you all again this year, even if you don't see me! Cool! I just got back from working on lighting at the haunt. It's looking insane! I think you will really enjoy it this year. Can you tell I'm fried from working on the haunt? I can't even make a post without screwing it up, lol! I'm killing myself now on it but it will be worth it when it's finished. I'm sure glad we open when we do. It would be impossible to open the first of October with the amount of work we put into it. Try and wear a hat or jacket with your logo if you want so I can try and pick you out.